starring: Megan Fox, Will Arnett, William Fichtner, and many more. So, I actually saw this movie the same day I saw Guardians of the Galaxy. I enjoyed TMNT way more than Guardians. The plot was more interesting. The jokes were funny. Megan Fox was not a terrible actress. From the previews, I thought the movie looked cool. I was interested in seeing the movie. My one concern was how Megan Fox would perform as April O'Neil. Whoever edited the previews made Megan look terrible because she seemed to be making the same shocked and terrified expression over and over again. I had never seen a film with her in it either, so I didn't know what to expect but she turned out a decent performance. Nothing cringe-worthy. As far as the plot goes, I'm not really familiar with the original story so I can't compare this new version with it. I vaguely remember seeing the older cartoon and movie... vaguely. April's father was a scientist and he worked with another scientist who was a bit of a whack-a-doo. The other guy was an apprentice to Shredder, who was supposed to be the main villain and head of the Foot Clan but we hardly see him in action except for the very end. When April's dad found out their plans to poison people and charge a lot for a vaccine, he tries to put a stop to it by destroying his research. That brought his demise. The research was mutagen experimentations completed on four baby turtles and a rat. Lucky for them a young April saves them last minute from the fire destroying the lab. That was one thing that seemed a bit off in the story: April the saviour. It was strange that she would be at the lab to see the fire and save the animals but not see what had happened with her father's murder. It wasn't explained what her reaction was after such a devastation either yet that did allow April's character not to go down a vengeful path. The baby turtles grow up and so does the rat. They all transform and then decide to learn ninjutsu to make sure they always protect themselves. It seems like a strange concept but then you also get the explanation that master Splinter was a very smart rat, able to understand people and his environment so it doesn't seem so far fetched for them to study to become ninjas. It was a kind of strange coincidence though that would work with Shredder's background. Once Shredder and his apprentice find out the experiments are still alive, they track them down and attempt to complete the plan they had originally dreamt up. 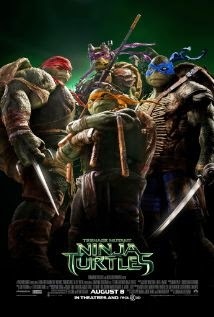 The turtles, master Splinter, and April all play their part in taking down Shredder and that other guy. Really fun movie. It was cute to see Michelangelo flirt with April. Those light-hearted moments with the turtles, like the fun scene in the elevator, remind the audience that these guys/turtles are teenagers despite what their size and strength might indicate. I laughed a lot and had a good time. I give this movie 4 out of 5 stars.